If you love trains, mountains, or both, then this is the ideal trip for you. The Bernina Express, a 122 km train journey through some of Switzerland’s most breath-taking and picturesque scenery, is an unforgettable experience and a great way to savour the diverse Swiss landscape on a short trip away. We had been on a short weekend break in Varenna, a gorgeous small Italian town perched on the shores of Lake Como. To start our Swiss adventure, we took an hour-long train ride to Tirano at the foot of the Alps. From here, we picked up the Bernina Express, which would take us up into the mountains and connect us to the final stage of our journey, a short hop to Zurich for an overnight stay. Tirano is a sleepy little town on the border with Switzerland. 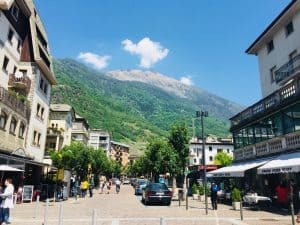 When we were there, we could find very little open, but there are a handful of reasonably priced restaurants in the main square where you can have a leisurely lunch before boarding the train (it’s a good idea to grab something as refreshments on the train seem to be limited). This trip wasn’t planned for me – it was a gift for my travelling companion who has a bit of a thing for scenic train journeys: apparently, there’s a romantic charm and sense of adventure wrapped up in the experience, as you sit back in comfort and await the dramatic scenery that unfolds right before your eyes…I had never really had this level of appreciation for such train journeys, but I certainly did afterwards. We boarded the train a little after 2pm, taking our seats in the carriages, which are surrounded on all sides by large windows (much larger than on your standard train) to enhance the panoramic views; we were initially a little disappointed not to have been able to reserve seating right next to them, but we needn’t have worried: people frequently get up and down from their seats to snap pictures of the amazing scenery or to look out from the open window at the end of the carriage. So you won’t miss out, wherever you’re sitting. When the train started slowly pulling out of the station, the sense of excitement in the carriage was palpable: this was going to be a memorable afternoon. The fact that the information booklet handed out on the train told us that The Bernina Express is a moving UNESCO World Heritage site with 55 tunnels and almost 200 bridges and viaducts along its route, only added to the anticipation. 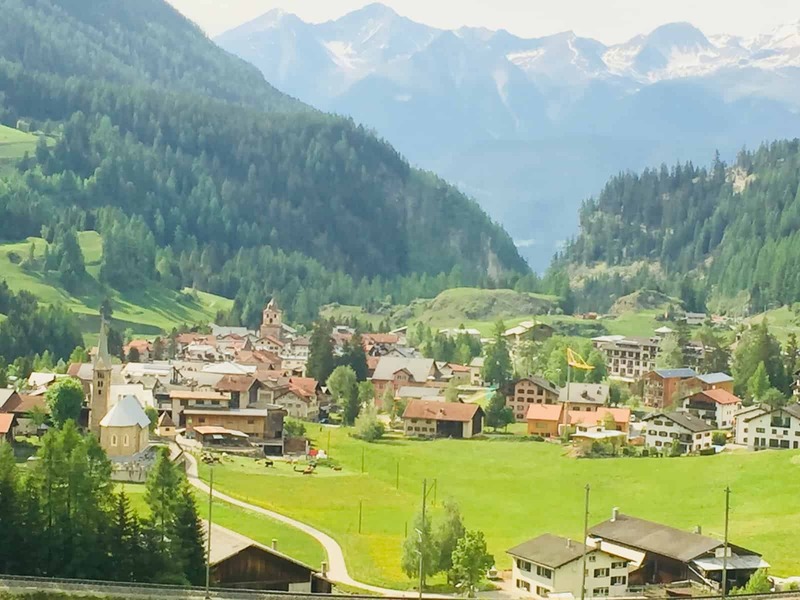 The train painstakingly moves up, out of the town and into the mountains and within a few minutes, you’ve reached a small station, picked up more travellers and crossed the border into Switzerland. The journey then takes you through a dazzling array of contrasting landscapes: past small picturesque villages with quaint stone houses nestled into the hillsides, through lush green meadows (for those of a certain age, think “Heidi”), and via wide valleys where the train skirts around large glacial lakes, past grand alpine forests, and up into barren and icy mountains. The variety of scenery on offer is staggering and was a great contrast to the urban sprawl of some of our other weekend breaks away. 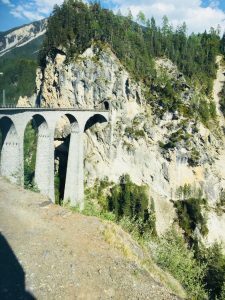 The train trundles over bridges and viaducts, including the Landwasser Viaduct with its 328 arches, and the Wiesner Viaduct which is over 650 feet long, and through tunnels gorged into rocks, before re-emerging and snaking around steep mountain passes. 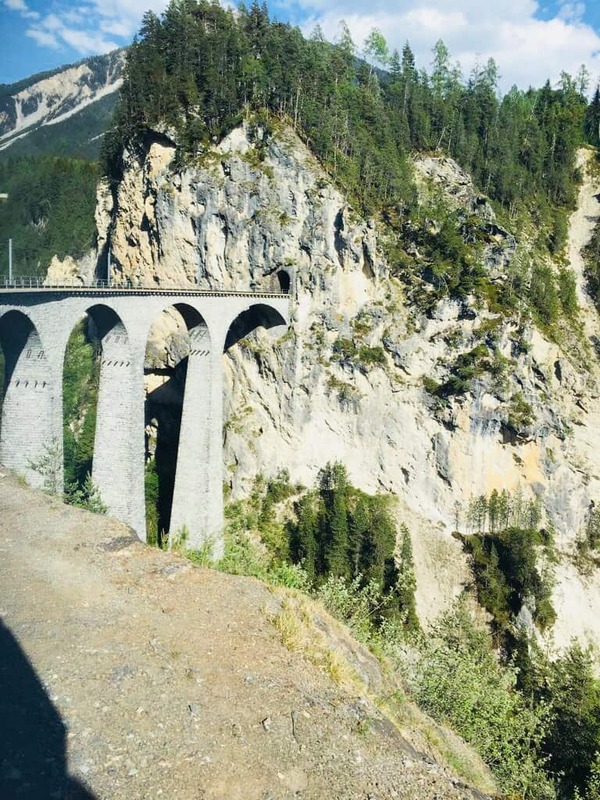 This was pretty amazing at the time, but since returning and finding out that the Landwasser Viaduct, built at the turn of the twentieth century, was constructed without scaffolding and only two cranes, gives a completely new perspective on just how amazing this train journey is. The photo opportunities are endless (make sure you’ve fully charged your phone or camera); the enormous windows afford the train passenger largely unobstructed views of the incredible scenery. 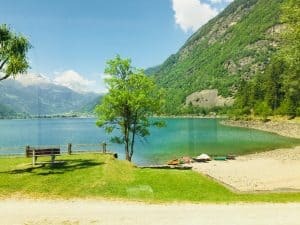 The fact that we did the trip in the summer meant almost perfect clear blue skies to complement the vibrant colours of the lakes and trees. 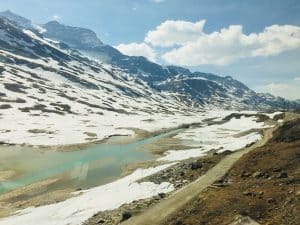 The most spectacular part for me was reaching the high altitudes of the Bernina Pass, over 7,500 feet high. 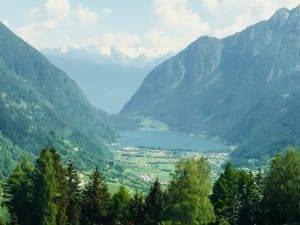 The terrain flattens and opens out here and there are aquamarine lakes surrounded by snowy mountains; it feels a bit surreal and even in the summer, you get a slightly icy chill go through you. The train stopped here and we got to get off for a few minutes to take in our surroundings – whether this happens on every trip or was an impromptu stop I don’t know, but either way, it was a real treat. 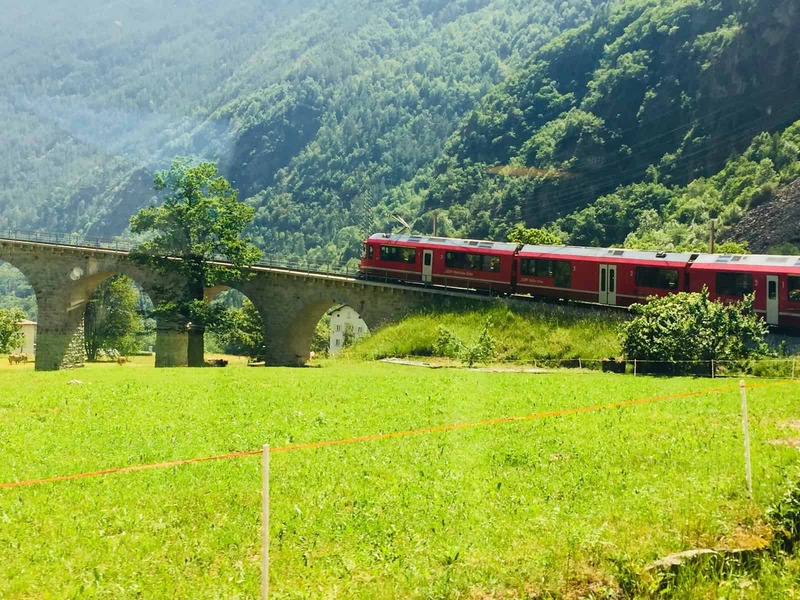 If you’re interested in taking the Bernina Express, bear in mind there is more than one route to take on, depending on where you board and disembark: see www.rhb.ch/en/panoramic-trains/bernina-express for more information. 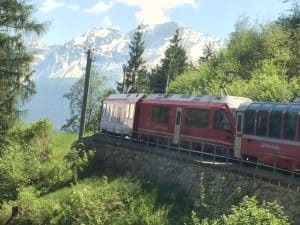 The other famous train trip in Switzerland is the Glacier Express; this runs from Zermatt to St Moritz and in total covers 180 miles (this is apparently a seven and a half hour train journey). If trains are your thing, also see my post on the Soller “Orange Express”, a two stage train trip from Palma de Majorca to Port de Soller. Not only is it worth a few hours in this pretty seaside town, but the journey on the old-fashioned train and tram is a real delight. Your posts always inspire me, I really want to do this train journey one day! What beautiful pictures! 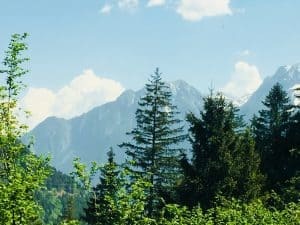 And useful travel information- another great travel blog from you! I’ve been on the Bernina Express and have walked on the Bernina pass – it’s a truly unforgettable experience, and your beautiful photographs capture this perfectly, Emma!